There are some nice elements to this Apollo Evade Mens Mountain Bike that give it plenty of appeal to less experienced riders. It is clear from the specification for this bike that Apollo have created a lesser version of other mountain bikes for a less experienced demographic. There are benefits here as this make it a helpful first mountain bike for teens, or a more interesting commuter bike for adults. The aluminum frame is still light enough for most people at 16kg, there are 21 speed Shimano gears and the mechanical disc brakes are still pretty responsive. This Apollo mountain bike may be cheaper and a little more basic, but it still has features that other brands might miss out. There are some nice grips on the handlebars, the pedals are included and the paintwork is smart with a subtle approach to the branding. There is also the nice addition of the quick-release front wheel for transportation. The downside is that some riders will need to upgrade the Apollo Evade to get everything that they want. There are aspects to the design and finish of this mountain bicycle that aren’t quite up to the standards of some mountain bikers. Yet, this is to be expected from the description and price. Complaints about the seat are easy to overlook because this is true of many high-end mountain bikes too. Others have changed the tyres and added some mudguards. One aspect that is a little more difficult to upgrade is the suspension. This mtb has a 60mm fork with front suspension only, and no adjustable damping. The cushioning and response isn’t to everyone’s liking, and does limit the bike’s potential in tougher terrains. 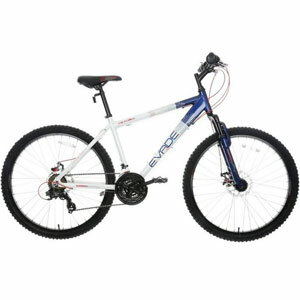 Are the positive features enough for a positive recommendation for this Apollo Evade Mens Bike? In the end, this is a budget bike that tries to bring a sense of mountain biking to those that either can’t afford a top level bike, or want an entry-level approach. The experiences of first-timers and teenagers shows that this does meet its aim, and is therefore still a recommendable option in this situation. Improvements to the suspension could help in future models, but there is still plenty to appreciate with this Apollo mountain bike. 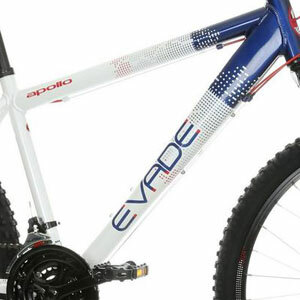 Find more reviews about the Apollo Evade Mens Mountain Bike on Halford here.